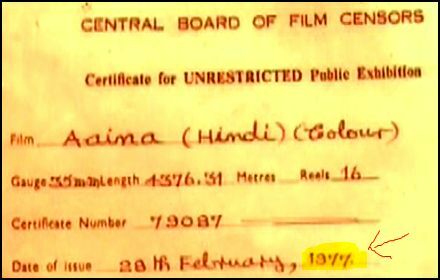 I had originally tried to order Aaina (1977) from Netflix, but got the 1993 version of Aaina instead, which I reviewed HERE. 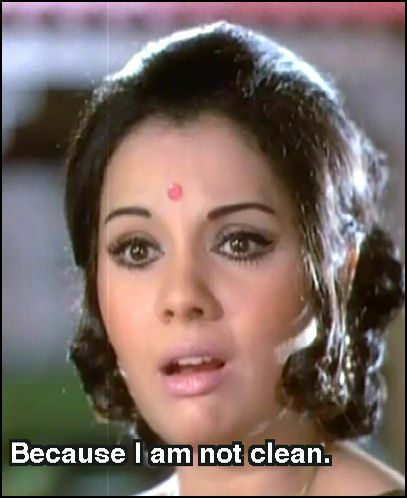 I eventually did get the 1977 version of Aaina that stars Mumtaz and Rajesh Khanna. 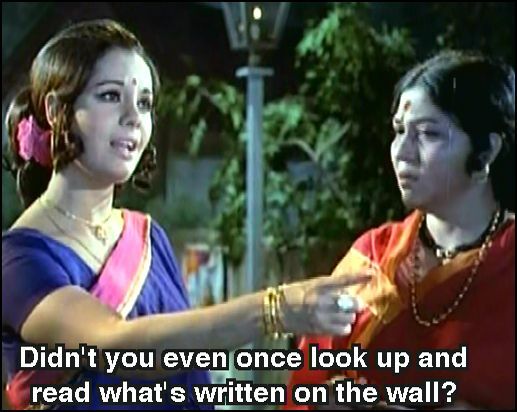 I would not be tricked by Bollywood’s duplicate titles and miss out on my original plan to see the 1977 version! Shalini (Mumtaz) is a poor yet happy brahmin girl who spends her time laughing and smiling, despite her family’s poverty. Ashok (Rajesh Khanna) and Shalini like each other but are from different castes. They tease each other and have a lot of fun, but ultimately they come to understand that society’s norms will keep them apart. Things continue to worsen for the family when the dad’s evil sister, Janki (Lalita Pawar) comes with her daughter to live with the already financially stressed family. Janki doesn’t do a thing to help out, in fact she just spends time going to frivolous Bollywood movies and gossiping. When Janki finds one of her starving nephews begging for food she fails to understand that her taking money to go to the movies has caused the problem since that money would otherwise go for food for the children. 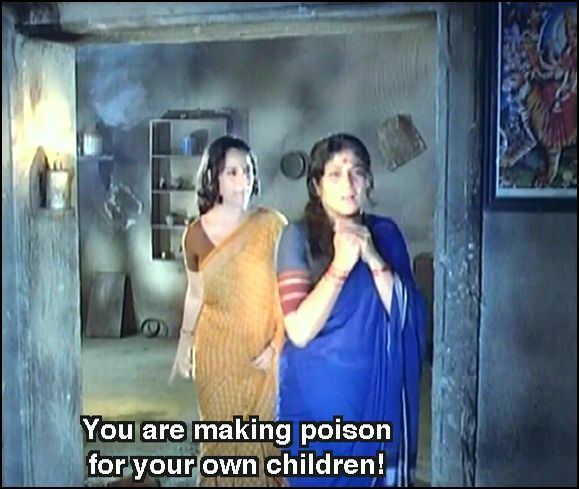 Then Shalini finds her mother one night mixing poison in with the food so the she can poison the family out of their misery. The next obstacle is that one of Shalini’s brothers wants to go to medical school, so in an attempt to get a recommendation to insure his entry to the program, Shalini travels to the big city. She stays with some friends of the family in the a home with a large central split staircase, so often seen in Bollywood films, hai na? 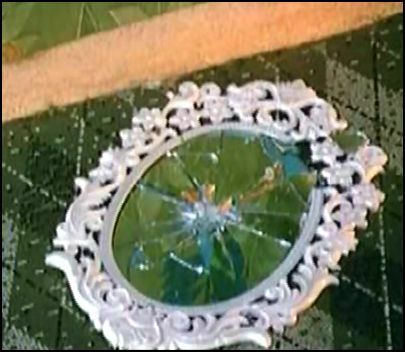 Shalini’s connection to try and get the recommendation for her brother’s entry to medical school is a fraud, and the situation ends with her being raped, as represented by a mirror aaina being broken. She then hears of another person who can help her get the medical school recommendation, who invites her home to meet his wife. But the wife is not there, only her picture is on the wall, and this powerful man has the same nefarious interests in Shalini as the man who first violated her. So this is how Shalini, a young Brahmin girl, eventually turns to prostitution to support her family. One night she’s enjoying the company of a client, and he discovers that she’s Brahmin like him. Note the symbolism of the mirror aaina on the wall saying hey, why don’t you look at yourself first yaar, before you point any fingers. Shalini points out the ridiculousness of his hypocrisy and returns his tight slap to her face with one to his face. Ironically, later in the movie when Shalini returns home to pay for and attend both her sister and brother’s weddings, who turns out to be the groom for her sister? Not to spoil things, but it’s this creep here! I learned from Suhan, a commenter on my 1992 Aaina post, that Laaga Chunari Mein Daag (2007) pulled from the 1977 Aaina. This one comes out smelling of mothballs, like a wedding dress stored for decades in an attic trunk. Not surprising, since the plot is vintage 1977 from Aaina, and the 1995 Marathi film Doghi. (Hindustan Times). If you’ve seen LCMD, perhaps like me you remember once Rani Mukerji became a high class call girl, she lived in a super deluxe apartment in Mumbai. This was the only shot of that apartment I could find, but you get a general idea of its sleek, modern look. Sometimes it was a shock just who would stop by, like in this case, her friend Ashok from back home who told everyone he died in the war. After knowing he could never be with Shalini, Ashok faked his own death, but eventually years later fate brought him right to her door! Is that double lucky kismat at work or what? Not only does he get a prostitute, but she’s also the woman he loves! What are the odds of THAT happening!? Alas, Shalini is shocked and ashamed. Don’t you love that torpedo/bullet bra she must be wearing under her shirt? Despite her circumstances, Ashok understands and more importantly accepts her as she is, and wonders what could have been between the two of them and life hadn’t taken them on different paths. Shalini sacrifices herself to fund her family and is disgusted to return home only to find her mother pregnant again! There are already about 8 kids in the family. Of course her mother has no idea just what Shalini has done to earn money. Seems word has gotten out around town about Shalini’s new job and her little sister points out how her music teacher (paid for by Shalini) was staring at her. Shalini flirts with idea of suicide to answer the question of her eternal suffering, but when she’s about to jump, she hears the sounds of her siblings calling to her. So how do you think it all ends? If you’d like to know more, please go to see the plot summary by rAjOo. I’d love to hear your impressions of Aaina too. Aandhiyan in 1989. LOL on your link and han ji! Jean Paul Gautier has nothing on Bollywood retro fashion. Well, I won’t be looking for this film just yet. It won’t be nearly as entertaining as your write-up. Yes, those stairs are everywhere. Do you have a collection of them going on? I think I need a collection too. Chandeliers would be the obvious thing to look for, but helicopters are almost as much an essential ingredient in a Bollywood movie. They manage to sneak them everywhere. Yes, I think that’ll be it. Now, to rewatch all 110 movies I’ve seen so far! Pound for pound (how does one say that in Hindi yaar?) Aaina of the 90’s delivers more outlandish drama. The 1977 Aaina was about a 6/10 for me, and only a 6 for the prostitutional sacrificial theme, Mumtaz’ great outfits and their transformation from grim, threadbare saris, to her groovy call girl get ups, and those pin curls! The Juhi/Jacki/Amrita show was much more fun and chock full-o-tantrums. I feel at peace now that I’ve seen both and documented my impressions here. Om shanti om. I haven’t watched Aaina but I’ll preemptively say that I prefer the Tamil version, Arrangetram. It wasn’t great, but it had its moments. Better yet, it had a then 18 or 19 year old Kamal Hassan 😉 I read somewhere he had a small part as a dancer in Aaina, which is the only reason I’d want to give this a look-see. Now you know I will now have to see the real deal Tamil version. I also read that Kamal was in this one, and I had to rewatch it to catch it. He’s in the seen of the movie being filmed within the movie where the song Jaane Kya Ho Jaye I’ve linked above is. Before they start the song, he plays a director, and is wearing a hat and glasses as I recall, so he’s sort of incognito. If he also played a dancer I didn’t catch that. I can certainly imagine a young Kamal Hassan being fetching to see. I remember the first time I saw him, not knwo he was a HUGE south Indian star, was in Saagar, and forget about Dimple’s comeback and her reunion with Rishi, for me Kamal stole the show hands down. LOVED him in that. Now having seen more of him, I think he’s a bit too something or other, like in Hey Ram, I found his part a bit too self serving, but I still enjoy his performances and need to catch up on seeing this legend at work. In addition to Hay Ram and Saagar, I’ve seen him in Dasavathaaram, Vettaiyaadu Vilaiyaadu, Chachi 420, Thillu Mullu, Sathya, Sadma to name a few, but obviously need to see more of him. I shall try and get a hold of Arrangetram. Oh I love that family planning wall!!!!! 😀 Must see this. Have it, haven’t gotten to it yet, but clearly need to. The family planning was was spectacular. Have you read A Fine Balance? The mural sort of reminded me of the forced sterilization parts of the novel, but made it seem more fun. Don’t get too excited for this one though, worth a watch for sure, but more of a ehhh film. I do love the suffering Nirupa Roy and the ever bitchy Lalita Pawar and the sub plot that the kids starve because she spends her $ on Bollywood. I look forward to you writing it up or at least reporting back with your impressions dost. Balachander’s original Arangetram was a huge success – I think coz the story is set in a struggling tamil brahmin family and the movie had some powerful dialogues. Haven’t seen the hindi version nor inclined to although Rajesh and Mumtaaz make a good pair and have done some great movies! Yes, it seems that the original Tamil version was quite good, and I see the IMDB rates it a 9! I think as a rule the originals seem to be the best, na? Though in the case of Ghajini, I haven’t taken the time to see the original, even thought I love Surya’s movies. Thanks for taking the time to comment and make the recommendation. Sitaji – Arangetram was made in the early 70s. I think the hindi one was made a few yrs later. 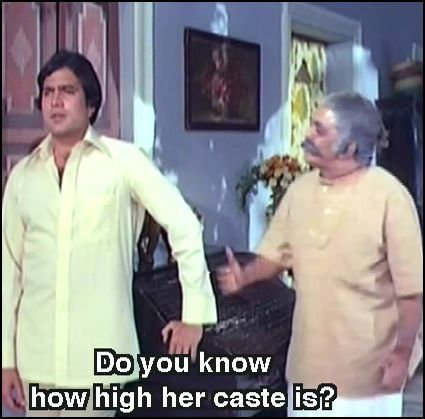 One has to keep in mind the Indian economy and society of the 60s/early 70s in mind while watching the tamil original. 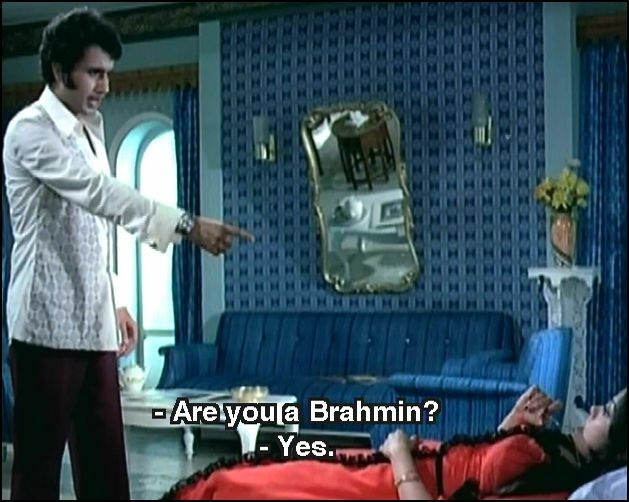 Balachander’s movies are simple and set within the socio/cultural and economic context of the community he portrays – hence the tamil original may not have the heroine wearing that many fashionable outfits like Mumtaaz in the hindi one. Again it would make sense in the original context. I think hindi film makers tend to make the glamour quotient higher no matter the theme/story – Ek Dujey Ke Liye is a case in point – you will notice the stark difference between the two versions. Re-makes are very common in Indian film industries (South/ Bengali movies made into hindi and vice versa). 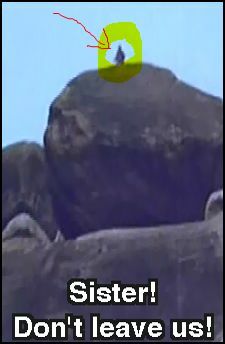 There are several examples of good movies from the South which the hindi re-makes have not been able to match (although they have been hugely successful) – Sethu (tamil) – Tere Naam (hindi), Pokiri (telugu) – Wanted (hindi), Maro Charitra (telugu/tamil) – Ek Duje Ke Liye (Hindi), Kadalika Neram Illai (tamil) – Pyaar Kiey Ja (Hindi), Annokokunta Oka Roju (telugu) – Sunday (Hindi), Alaipayude (tamil) – Saathiya (hindi) to name a few. The hindi film “No Entry” is also supposed to be based on a tamil original. Of course priyadarshan is known to remake many malayalam movies into hindi. On the other hand, there are some very bad examples of remakes ie where the original ones were bad enough but also were remade into hindi – eg the terrible 80s movies featuring sridevi/jayaprada/ Jeetendra like Tofa etc. Yes Surya was good in tamil Ghajini. The hindi one was good too. I wonder if there is any significance to the different types of staircases. 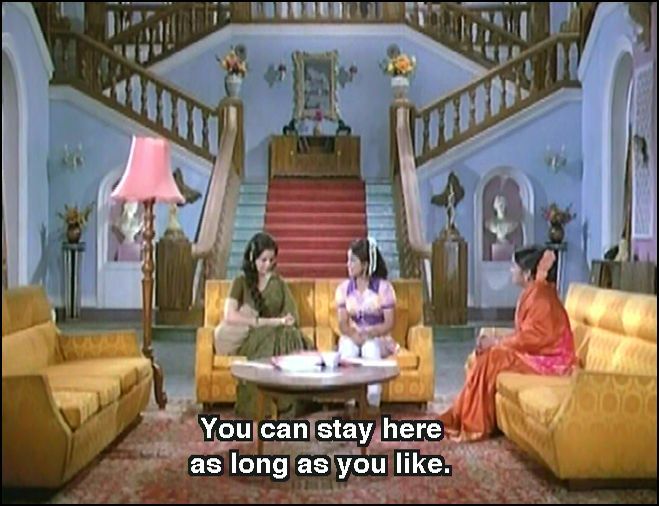 Note the curving staircase present in Jagdish Raj’s home (he usually plays a police inspector. ); does that imply a “crooked character”. But a straight one probably allows for richer histrionics, I am sure you are aware of the “pompous conservative father standing at the top and being able to fling his hands in both directions while lamenting his daughter’s husband choice”. I think Richard Nixon would have looked great on that straight staircase, while doing his “I am not a crook” speech, or his final victory sign. Thanks for educating me about the existence of the “torpedo/bullet bra”; till today I thought they simply used some of the conical demo objects found in a trigonometry or drawing class. Sounds like the genuinely tough issues of caste, women’s purity & family planning have been better dealt with than in LCMD, though I have not seen Arangetram. As usual, the review seems better than the movie. LOL. You are on to something here that warrents closer examination! (I am sorry to be sooooo late in responding to this too by the way, poor blog managment on my part, bady blogwallehing) The film was enjoyable, but not one I’d enthusiastically urge someone to see. If you do see it report back with your impressions. I think you need to start a staircase page on your blog! Do it! 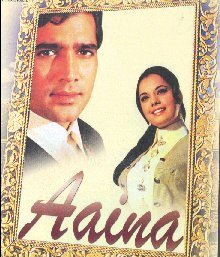 ‘Aaina is one best movie of Super Star Rajesh Khanna. Its better than tamil version Arrangetram. Super Star Rajesh and Mumtaaz make a good pair & ever green pair of Indian Cinema. Super Star Rajesh Khanna has performed very well. Balachander’s movies are simple and great. Thanks for stopping by to comment. 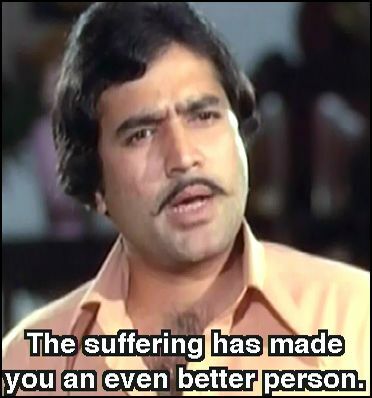 Your passion for Super Star Rajesh Khanna is admirable. 🙂 All the best! Wow, thanks for that list of Tamil remakes. I’ve see several of them. When a Hindi film gets weird, like Tere Naam, I wonder if it’s a southern remake, and Voila! That one is. 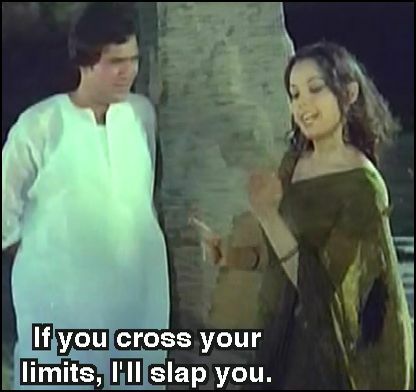 Whenever a Hindi film gets to a crazy level; e.g. kinetic energy, insane, vendettas beyond reason; the hacking off of limbs, etc.. Another remake I especially loved was Virasat, which reminds me that I should see it’s original southern version, Thevar Magan. Thanks for the thoughtful insight, and sorry for my late response.